Natural Dyes for Textiles: Sources, Chemistry and Applications is an in-depth guide to natural dyes, offering complete and practical coverage of the whole dyeing process from source selection to post-treatments. The book identifies plants with high dye content that are viable for commercial use, and provides valuable quantitative information regarding extraction and fastness properties, to aid dye selection. The book presents newer natural dyes in detail, according to their suitability for cotton fabrics, silk fabrics, and wool yarn, before describing the application of each dye. Extraction of plant parts for isolation of colorants, chromatographic techniques for separation, spectroscopic analysis of the isolated colorants, structure elucidation, biomordanting, pretreatments, and post-treatments, are also covered. 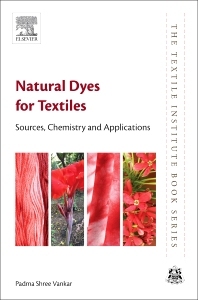 Prepared by an expert author with many years of experience in researching and writing on natural textile dyes, this book is an important resource for academic researchers, post-graduate students, textile manufacturers, technicians, dye practitioners, and those involved in textile dye research and development. Padma Shree Vankar is a Research Advisor at Bombay Textile Research Association (BTRA), India. She had previously worked as consultant at the Facility for Ecological and Analytical Testing (FEAT), Indian Institute of Technology, Kanpur. Dr. Vankar has been conducting research into textile dyes and colorants for more than 30 years and working in the field of natural dyeing for the past 14 years. She has published 130 peer-reviewed articles and six books and has obtained an Indian patent relating to natural dye. Besides lecturing and guiding PhD students when she was at IIT Kanpur, she delivers training programs to industrial dye technicians and has been involved in the production of three documentaries.